Green Chile and a Bloody Mary: a Match Made in Heaven? A reader reached out to me and let me know that only a few miles up the road from me (130 miles actually), some New Mexico natives are making their own brand of Bloody Mary mix, and I got a bottle – a jar actually – to try out. 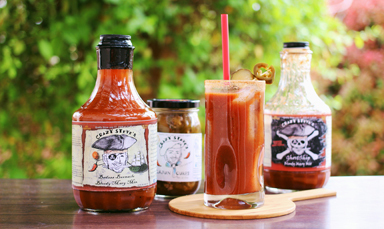 Bloody Maria is an all-natural Bloody Mary mix made with Hatch Green Chile and all non-GMO ingredients in Taos, New Mexico and has been on the market only a few months. First, we have to discuss the naming of this mix: a “Bloody Maria” is actually the name of a Bloody Mary cocktail which substitutes tequila for vodka. 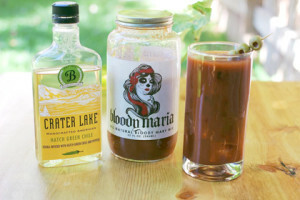 In this blog post, Bloody Maria does not refer to that cocktail, but to a specific brand of Bloody Mary mix. Okay? The 32 oz jar of Bloody Maria includes a particularly unique ingredient: Hatch green chile. I can tell you now that Bloody Maria uses chile right in this case. 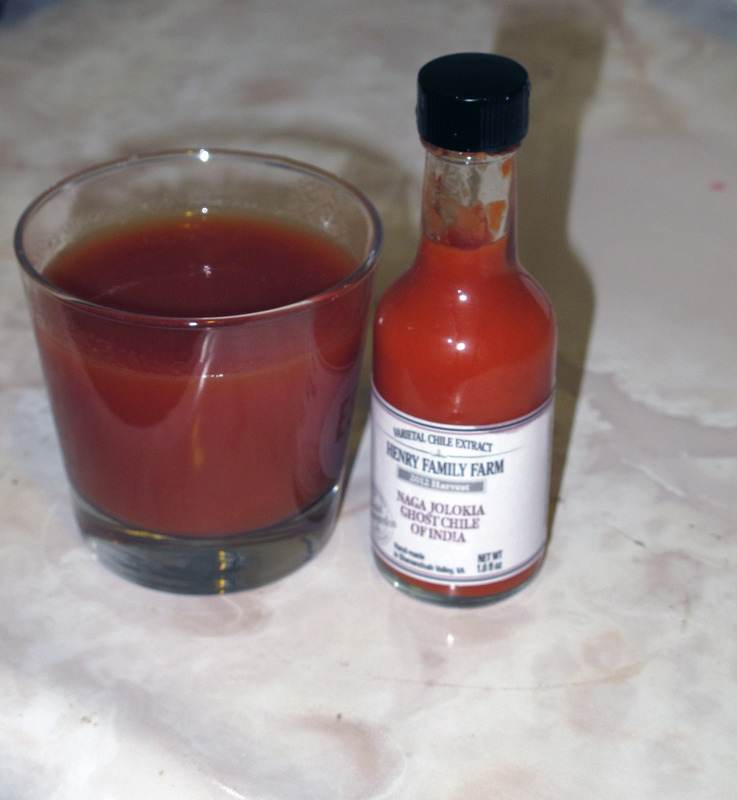 There is a firey bite to Bloody Maria (as all good Bloody Marys should have), but the flavor is good, natural, and quality with Bloody Maria, not too hot. On a thickness scale, Bloody Maria is square in the middle. I’ve had mixes that range from watery-thin to barbeque-sauce-thick, and this one’s right in between. It pours easy and mixes quickly. Now I initially intended on covering 2 separate liquids in 2 different posts here at the Burn! Blog, with this just being a post about Bloody Maria, but staring at the two on my home bar, I knew it would be a sin not to combine them. Liquid number two is Crater Lake Hatch Green Chile Vodka. This product is strictly seasonal for Crater Lake, so if you see it, grab a bottle. 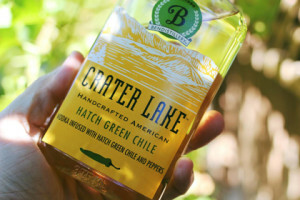 It’s got a lot of bite, just like Crater Lake’s pepper vodka does, and it’s very similar to that product, but there is some additional, noticeable green chile flavor in that flavor profile as well. So now that we’re caught up on both ingredients, my mouth is already watering, so let’s talk about the taste. Because both Bloody Maria and Crater Lake Hatch Green Chile are taste very good on their own, they’re a match made in brunch heaven, too, no doubt about it. Because of the burn that Crater Lake brings to the table, it increases the sizzle of the Bloody Mary in a noticeable way. Bloody Maria on its own is mildly spicy, but depending on the amount of this vodka that you add, it can get downright hot. There’s no two ways to put this: for a green chile fan (which I am), both a Bloody Mary and vodka with green chile is awesome: a great fit. I always add the vodka first, because it’ll be much harder to stir it if you add it last since the mix is so much heavier. 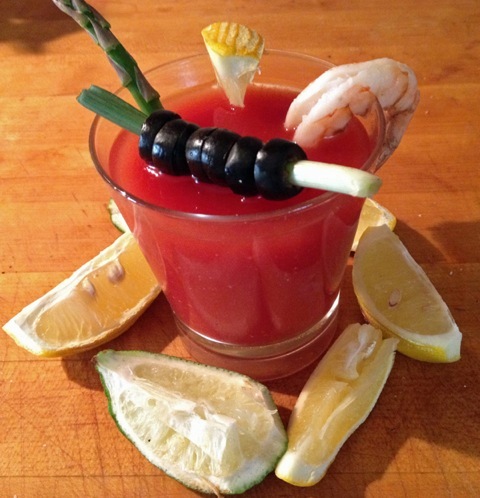 Garnish with olives, lemon, wedge, celery, beef jerky…or whatever you feel like cramming into it! 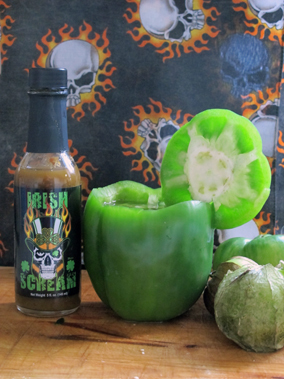 The Perfect Bloody Mary Irish Scream: The CaJohn’s Green Bloody Mary Project Ghost Chile Extract Bloody Mary Bloody Marys for Badasses?